October 5: KC Roundtable - KC Roundtable Breakfast. For 20-30 something entrepreneurs. Can't make it to MAX this year? We are bringing MAX to you! Designer, trainer, and author Nigel French will be presenting a hands-on lab at Adobe MAX on Type and Layouts in InDesign CC. This popular lab has filled up three sessions at MAX and is currently filling up a fourth, but Nigel is joining us live online from California to give KCDesignCore a preview at our October meeting! 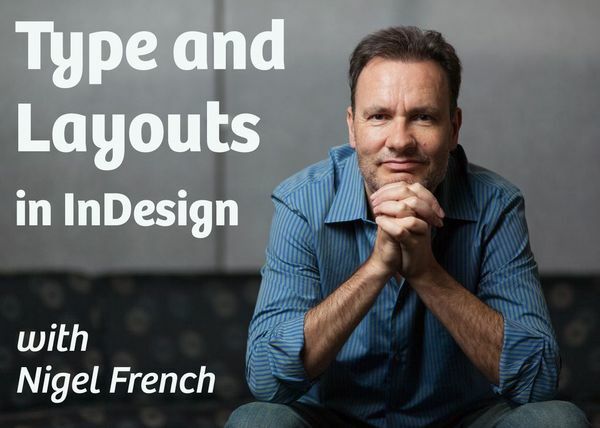 Adobe InDesign has powerful tools for typography, and Nigel literally wrote the book on it: In addition to being a prolific author on Lynda.com, Nigel's book, InDesign Type: Professional Typography with Adobe InDesign, is currently in its third edition. Take your type and layout skills in InDesign to the next level: prevent and fix common composition problems, structure your pages with layout grids and baseline grids, and make the most of margins, leading, and letter spacing. Join us at 7 p.m. Monday, Oct. 2, at Centriq Training, and bring a friend! October 5: Hammerspace Community Workshop and Makerspace - Open House Night For New Visitors. Come tour the workshop & meet fellow makers. nearsoft is a software company that works with development teams in different countries, often in different time zones. They noticed that Agile events weren't usually properly executed, nor was there a follow-up and more often than not it was a waste of time to wait for everyone to be read. So, it was very hard for Management teams to really perceive the value of Agile. They will share best practices on how they use Atlassian tools and add-ons to enable Agile methodology events for remote teams. Unit testing is an often overlooked and maligned aspect of the software development. Written off as time consuming to write and expensive to maintain, applications are frequently shipped to production with little or no unit test coverage. This is unfortunate as unit testing is critical to adopting CI/CD practices which help development teams deliver code to production faster. During this presentation we will cover some of the psychological and technical reasons why unit testing is often neglected and how to overcome these challenges. We will then looks at some tools provided by Spring and other libraries that make unit testing much easier and more effective. At times, we ALL struggle! The Art of Active Networking is a worldwide networking group that asks "How can I help you do better right now?" Remember, "The power of us all working together is so much greater than anything we can accomplish on our own." BE WELL, BE CREATIVE, BE GREAT, BE GIVING Mark E. Sackett. 6:30pm - Open Source Hack Night, PHP TestFest 2017 Continued! October means that it's Hacktoberfest time! To qualify for Hacktoberfest, you just need to submit 4 pull requests to one or more open-source projects during the month of October. We'll start by writing some PHPT tests for PHP TestFest 2017, which lasts through the end of December. This month we’ll discuss how to easily use Microsoft’s new Forms to do our work and apply the information collected. We’ll also hear insights from attendees of the recent Microsoft Ignite conference. This is a great event for newcomers and Smarter SharePoint veterans alike. Come with questions and stories, as this is a social event to meet people in the Kansas City area who are users of, experts in, or curious about SharePoint! To get more information about the group, request to join the LinkedIn group or visit our website SmarterSharePointKC.com where you can join our email group to get notifications about meetings. This month's Agile KC meeting will be this Thursday 9/28/17 6:30 PM at Centriq Training. Meeting Topic: More Agile Games! Agile KC & GALE KC (Games for Agility, Learning and Engagement) - We've decided to join forces - TWO Meetups in one! How do you expose Scrum to new teams, or new team members? Shall we play a game? Let’s! First we will play the card scrum game, details can be found here http://tastycupcakes.org/2016/06/scrum-card-game/. Next we will discuss Lego4Scrum (https://www.lego4scrum.com/), We will wrap up with a discussion of the Agile Fluency Game. Use this form to submit up to 3 topics for consideration for the Fall 2017 Iowa Code Camp, November 4, 2017. Members of this group will discuss technology around the end users experience. Exploring, creating and designing better user experience. Cerner has three Jira instances, all are housed within our Kansas City data center. We have increased performance from our KC data center to Bangalore India by 30%. This was done using F5 BigIP LTM using smart caching, compression, and HTTP/2. There were no changes to the Jira software to increase performance. Learn to use insulating foam to build props and sets as you carve, coat, and paint your very own stone or brick dungeon walls! All materials included. Note: This is a messy class, so dress appropriately. Close-toed shoes are a must!